MotorDog69’s Set Screw Harley Horn Cover Coin Mount set with Don't Tread On Me coin. 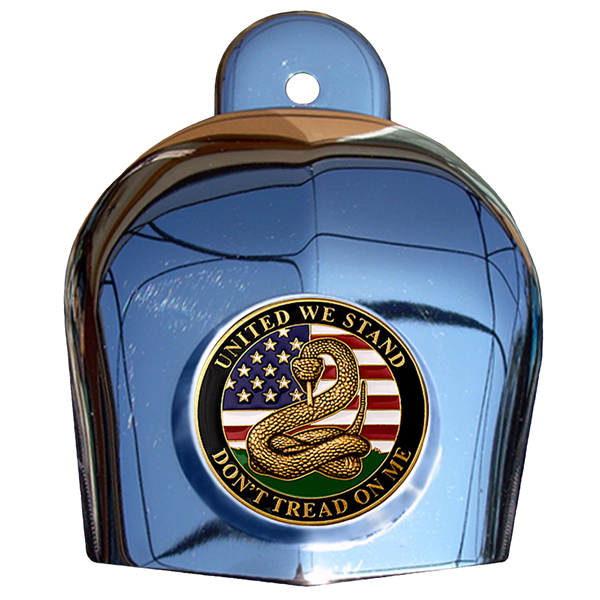 · Fits all 1992 to 2017 stock Harley Cow Bell Horn Covers. · Now you can "Mount a coin, ride with pride, flip coin over, or re-mount a new coin, to get a new personalized look". · USA Patented and Engineered, Show Chrome Plated. · Bundle Includes; Set Screw Chrome Harley Horn Cover Coin Mount, Challenge Coin Shown, Set Screws, Allen Wrench, and Easy to Follow Instructions. Personalize Your Ride Today! · Kit Benefits; Easily mount and remove challenge coins to personalize your own stock Harley Horn Cover. · You can loosen one of the set screws in order to flip the coin over to display the other side, or remount a different coin, to get a new personalized look. Coin mount attaches with rtv silicone, found on our website. · MotorDog69 Is The Inventor and Designer Of The World’s 1st Adaptable Challenge Coin Mounts For Motorcycles And All Vehicles.